Some course policies are designed to help maintain the grounds. For example, golf bags should never be carried onto greens. Each golf course has its own rules, whether it’s a posh country club or the neighborhood course where you can pop in anytime to play nine holes. Some policies, such as those that discourage slow and unsafe play, are universal. Only private clubs have membership requirements, and private clubs' rules generally are more expansive than those of a public course. For example, the semi-private Holiday Hills Country Club in Mineral Wells, Texas, has an 18-page “Polices and Procedures Manual.” In contrast, the City of Bloomington, Illinois, has a single page of polices and procedures on its parks and recreation website. The basic rules of golf etiquette apply everywhere, written or not. The Westport (Connecticut) Parks and Recreation Department, for example, bars players on its Longshore Golf Course from “throwing of clubs, running or jumping on greens, carrying bags onto greens, pulling of handcarts onto tees, aprons or greens, and reckless operation of a golf cart.” It also reminds golfers to yell “fore” and wave to gain the attention of any course workers in the area before hitting. Other universal golf course rules include caring for the grounds by replacing divots, raking bunkers and repairing ball marks on the green. 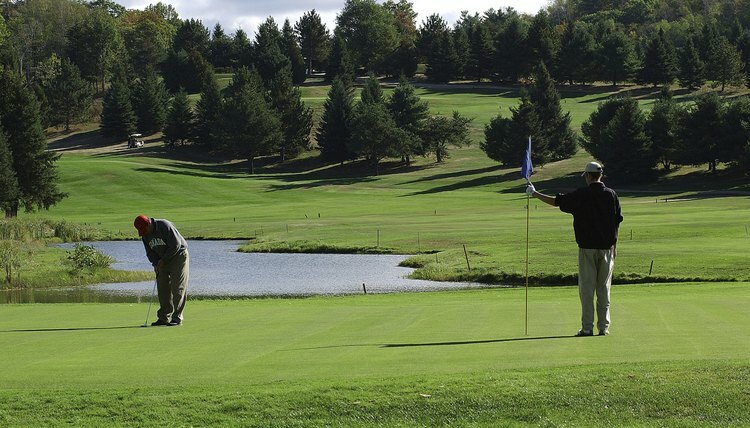 Courses typically encourage players to complete nine holes in less than four hours. The City of Bloomington says, “If your group falls one complete hole behind the group ahead, you are required to allow the following group to go through yours.” Speed of play will often trump etiquette, even at private clubs. Colts Neck’s policy states that if the player with the honor isn’t ready, another member of the group should hit. Country clubs often have stricter dress codes than public courses, although the City of Bloomington notes that proper golf attire is always required. "Shirts must be worn at all times," it says. "Tank tops are not allowed.” Colts Neck requires men to wear collared shirts and forbids players from wearing blue jeans or “short shorts.” The Eagle Creek Golf Club in Florida prefers collared shirts but permits mock turtleneck golf shirts for men and sleeveless/collarless golf shirts for women. The club doesn’t permit “athletic” warm-up suits or shorts. Whitehawk Ranch specifies that shorts must be “mid-thigh length or longer” for both men and women, while Canebrake instructs members “to dress in a fashion befitting the surroundings and atmosphere provided in the setting of the Club.” Most courses, public and private, bar shoes with metal spikes. Private electric carts are typically not permitted at public courses, but may be allowed at private clubs. The Holiday Hills Club, for example, permits members to use their private carts, provided the driver is at least 14 years old if unsupervised. Holiday Hills permits children ages 10 to 13 to operate private carts with parental supervision, but the club’s carts may only be driven by a licensed driver.